As a principal analyst for a travel industry research firm, I get a lot of briefings from travel startups. That’s one of the best parts of my job. It’s a direct line of sight into what entrepreneurs and technologists in travel are thinking about, what excites them, and what pisses them off. I started this vacation rental website because my second home was sitting empty most of the year. We started this travel planning site because my wife and I tried to book this trip to Italy and we had to go to a lot of different websites and it was very confusing and frustrating…. But there are plenty of gems too. I remember my first conversation with the founders of Airbnb, I think back in 2010, when it probably wasn’t much more than three guys in a room. But even in the case of some of the most obvious “me too’s”, I can’t help but feel some admiration. It’s no small thing to take such a risk in a crowded and relentlessly competitive industry like travel. Over the years we have seen so many startups, so we decided to dig into the numbers to see what we could learn about the state of startups in travel: where are entrepreneurs investing their creative capital, and where are investors placing their bets? First, we set a few parameters: companies had to be founded between 2005-2013, and they had to be focused on travel and digital. And they had to be real. We had to see a real product or at least have some credible and verifiable backing. In other words, there had to be a little more than a couple of developers in a garage, or a fancy pitch deck. We ended up including almost 750 travel startups. Combined, those companies raised approximately US$4.8 billion over the eight-year period. That includes angel, venture and later-stage investments as well as strategic acquisitions. We excluded IPOs. Has the market been pretty hot? Well, the majority of that funding happened in just the last three years — more than $3.3 billion. This was led by some bigger deals with companies such as Trivago, Airbnb, Lyft, Uber and China’s Qunar, eHi Car Rental and Kuaidadi (it excludes the monster rounds raised by Airbnb and Uber in 2014). You could argue that ride-sharing and taxi-hailing services such as Kuaidadi, Lyft and Uber are not so much in travel as they are in local transportation. If we exclude them, a majority of the total funding would still have occurred within the last three years. One of the most exciting developments is the growth in startups coming from outside the U.S. and Europe. From 2011 to 2013, 30% of travel startups were founded in emerging market regions, but Asia — led by China — is driving most of that growth, not surprisingly. 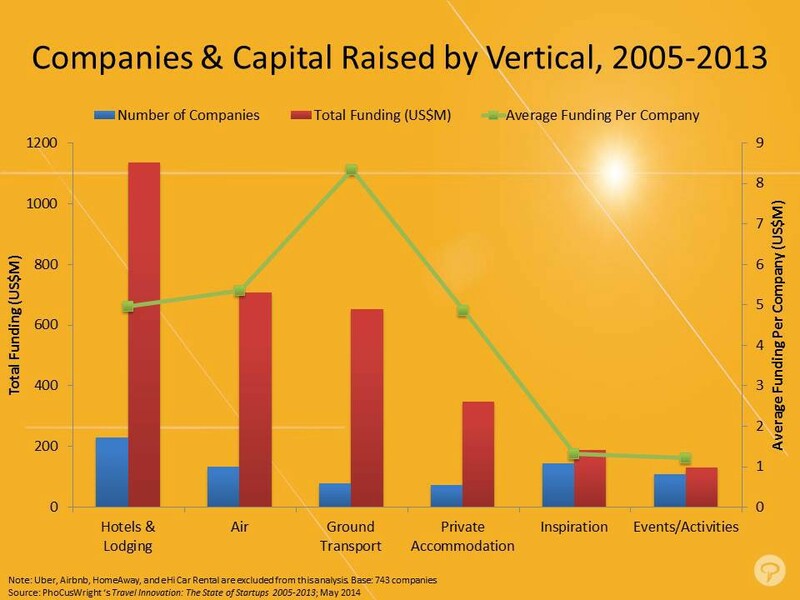 Vertical segment: the travel segment in which the startup operates (e.g., air, lodging, cruise, etc.). 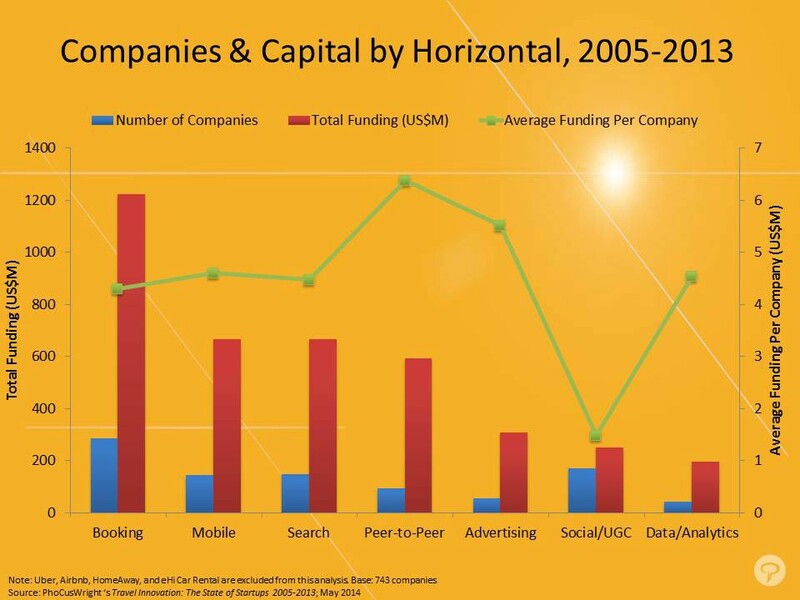 Horizontal focus: the technology, medium or business area on which the company’s activity is centered (e.g., search, booking, advertising, peer-to-peer, etc.). Not surprisingly, lodging rules (see Figure 2 below). Lodging is the largest global travel industry segment (if you include all forms of lodging), and its relatively large margins drive the majority of industry profits for online agencies and other intermediaries. The 243 lodging-focused travel startups established between 2005 and 2013 collectively raised nearly $1.2 billion. One interesting vertical category is “inspiration,” second from the right in Figure 2. We created this for the many travel startups focused not so much on a single traditional vertical, such as flights or hotels, but rather on the broader activity of trip planning, discovery and inspiration. This includes social travel startups, trip organizers, mobile content guides and other services. This category may be the second largest after lodging (nearly 200 companies), but it has one of the lowest per-company funding averages. While a lot of entrepreneurs see opportunity in the inspiration and travel planning phase of travel, investors aren’t buying in. We also analyzed startups by their commercial or technical area of focus. In other words, is their horizontal focus transactional (bookings), mobile, social media, advertising, etc. There is definitely some overlap here, as well as some subjectivity to the categorization. (For example, what defines a “mobile” travel startup, when virtually every travel company today must have a mobile play.) So we took pains to designate companies to a horizontal according to their core strategic focus. For example, Airbnb has a great mobile experience, but mobile is not their mission; it’s creating a peer-to-peer marketplace for lodging (and likely other related services in the future). So we tagged Airbnb as peer-to-peer, not mobile. Hotel Tonight is about mobile-only last-minute hotel bookings (you can only book a “Hotel Tonight” on mobile), so they are tagged for mobile. The biggest horizontal category is, not surprisingly, booking (see Figure 3 below). The transaction is where the revenue is, and many of these startups are companies bringing online transactional services into new markets. Those could be new geographies, such as Latin America or Russia, or new verticals, such as vacation rentals or local events and activities, where there have been limited online booking and payment options for travelers. Again the green line (average funding per company in each horizontal) is telling. The largest sectors on a per capita funding basis are peer-to-peer, advertising and data and analytics. Social/UGC is the second largest focus area for travel startups — a lot of entrepreneurs are trying to create the next TripAdvisor or Facebook for travel — but investors seem to have decided there already is a Facebook for travel (it’s called Facebook). The sharing economy is definitely having its day in the sun. Among the more than 90 peer-to-peer companies, there are two dominant vertical categories: lodging and ground transportation. The lodging peer-to-peer category includes Airbnb, HomeAway and their myriad imitators, while ground transportation includes the well-known ride-sharing services as well as car rental plays such as FlightCar and RelayRides. A third interesting category is in-destination tours and activities, where startups such as Vayable and Withlocals are creating marketplaces for local residents to become local guides. While this latter category is home to a number of startups, it accounts for just a sliver of travel’s peer-to-peer funding pie. Slam-Dunks or the Long Struggle? The big question for these nearly 750 startups is, how many have been successful? Of course, that depends on the definition of success. There have certainly been a few eye-popping exits, such as HomeAway, KAYAK, Qunar, trivago and Tuniu. There have been some incredible rounds of funding, including Airbnb, HomeAway, Uber, Lyft, eHi, Kuaidadi and Wimdu. But when it comes to acquisitions, the numbers are pretty small. Fewer than one in 10 companies have been acquired. And many of those acquisitions were not the big exits their founders (and investors) likely hoped for, but distressed asset sales or “acqui-hires” for developer talent. However, the good news is that only one in five of those companies has closed. The majority are still working toward that next round, trying to hit profitability (if they haven’t already), and still striving for that dreamed-of acquisition or IPO. At PhoCusWright we have done much more analysis and have detailed information on all of the 750 or so companies. We have invested a lot of analyst time and effort into this work, so we do charge for it. If you are interested, you can check it out here.